“I am the Alpha and the Omega, the Beginning and the End, who is and who was and who is to come, the Almighty. In my humble opinion, time is non-linear. Our analytical mindsets think time flows in a straight line and this is endorsed by the standard use in mathematical graphs of time as the ‘x’ or horizontal axis, as in this GCSE maths graph. Like an ‘x’ axis, time-lines list events in history – and we can use one for our own lives. After all, we live our lives in a sequence of events – one thing after another. When observed in nature’s season and oceans, however, the passage of time-related activity is continuously periodic, that is, cyclical. So I regard time like a spiral because, when considered dynamically under the interaction of various influences, it’s just like a corkscrew being turned. Consider drawing a circle and the position of pencil, or finger, as you time the motion. Done this way it can be plotted on an ‘x-y’ graph. With ‘x’ as time and ‘y’ as position on paper, it produces a curve looking like a wave of water – known as a sine wave- as in this diagram. Have you stood on a beach at high or low tide and noticed how long the water sits there? Its level slowly starts changing but at mid-tide the water rushes to the other extreme. It floods in full flow only to stall and stop, and then return to repeat its action – and again. SHM and its geometrical depiction explains those difference in tidal speeds. Watch the brief video under ‘Occurrences’ in Wikipedia’s Sine Wave. It shows a wave as a curve of dashes being produced as a point on the circle’s circumference plots the waveform – but its own motion is screw-like, is it not? 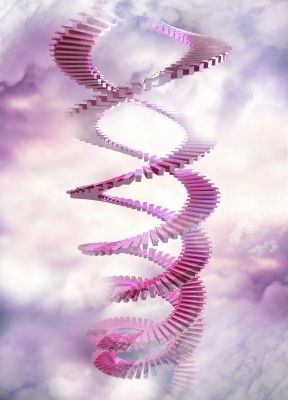 Therefore, we can think of time like an invisible spiral turning like a corkscrew. Also, nature provides another excellent example – and it’s one that carries information – the DNA spiral, of which there are two in each molecule. 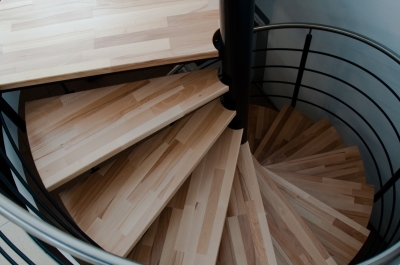 Let me explain some more with a simple analogy: on a spiral staircase we pass by different walls. If it’s in a castle turret there’d be a doorway on each floor and in the same vertical wall of the well. Regard this wall as a certain kind of event and note how it connects with us, or is relevant to us, at different times and levels. Hence, various types of event can crop up in a cyclical pattern of repetitions at different levels and show some development has taken place. So it is in history and with God’s plans too, could we but be aware, or receive divine revelation. …life (the markets, etc.) should be viewed as a spiral – constantly revolving in a circular pattern BUT never returning to exactly the same spot from which it came. It is progressing – forward & upward – even as it revolves in a type of circuit. Continue reading about this function of Time in this hub’s Cycles and the Bible. ALSO see On Engaging Time (18 Feb 2016) and A Prophetic Word From God About Time – And On Time (17 Oct 2016). For the latest on this topic see this blog’s Time category.